I had the opportunity to shoot something a little different a few weeks ago. 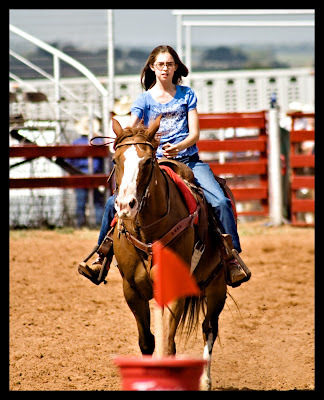 Our county had it's annual rodeo, and a friend of mine had a daughter participating in the kids' playday. It was midday, so the sun was pretty harsh. These were shot at 200 ISO, Aperture priority, various settings, with my 75-300 lens. Please CC! Thanks! these are great shots!!! i love that last shot--their expressions are so similiar! :) these are great! the middle one is a great action shot. the last one you captured such intensity in her face. nice shots!!!! Under those conditions, you got fantastic results. I have so much trouble getting good action shots like this. Nicely done! That third one is so great! The expression on both the horse and the girl are so intense!! Great action. These are great action shots! I love the expressions in the last one... of both the girl and the horse! I found your blog while searching for rodeo cowgirl pics. 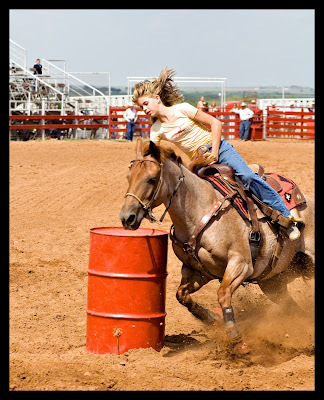 I'd never even heard of barrel racing but I soon discovered how exciting it looked in the photos. 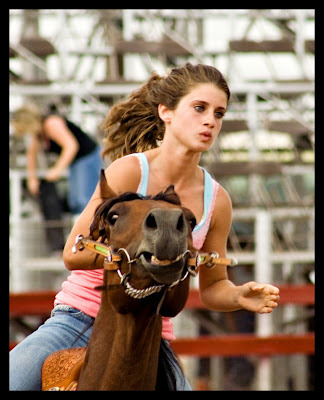 Yours are the best photos of barrel racing I've seen and I've spent several hours hunting the web for ones of similar quality. The one I like best is the blonde girl in the t-shirt turning right around the barrel. It's perfect. Catches the excitement, her expression, the folks in the background. 5. girls wearing t-shirts. Most wear a heavy shirt. I've use the blonde rider as a header for my blog containing lyrics of country songs I've written, justcountry.wordpress.com. Hope you don't mind. If you do then please write me a mikejasmine@gmail.com and I will immediately replace it. On the other hand if you don't mind my using it then would you please send more? I'll rotate them in the header, and feature some in appropriate songs (see "country girl" as an example of my collages). I'm going to add you to my blogroll today. I use the full picture to introduce the song "country girl" and have added your blog and profile links. Also blogrolled "Picture This Photography".